Kay Plumbing is locally owned and operated in Lexington, South Carolina. That is why we care so much about the quality of plumbing services in your home and businesses, we are your neighbors and what is good for you is good for us. In this article we want to explore why it is important to use a licensed professional plumbing company to install and maintain your water heater. Water heaters can be one of the most expensive plumbing services you may ever need in your home. There are many codes and regulations necessary to follow when dealing with water heaters to ensure the quality of your water, not to mention the plain discomfort of having to take a cold shower when a heater is installed wrong. That is why we at Kay Plumbing want to share with you 30 reasons why you should use a trusted company. 1. WE BELIEVE IN THE BEST FOR YOU We know how well water heaters can work and how safe they can be when properly installed. We also know the downfall and dangers of bad installations. That’s why we believe water heaters should be installed only by professionals. 2. THE RULES HAVE CHANGED As of July 1, 2003 all conventional 30, 40 and 50 gallon residential gas-fired water heaters must comply with new, stringent standards regarding Flammable Vapor Ignition Resistance. Bradford White has created the Defender Safety System™, a cutting edge technology that fully complies with the new standard. Your professional installer knows that he can count on Bradford White to meet these requirements now and in the future. As of April 2015 new edition of the National Appliance Energy Conservation Act (NAECA) from the U.S. Department of Energy (DOE) is set to take effect. All water heaters manufactured and sold in the U.S. have to meet more stringent efficiency requirements. Tank water heaters with storage capacities from 20 to 50 gallons have their physical dimensions enlarged to accommodate the additional insulation needed to meet the new efficiency requirements. 3. A GROWING FAMILY NEEDS MORE HOT WATER When your family grows or when you add a large tub, a shower or even an entire bathroom, your demand for hot water increases. A professional can help you with access to models specifically built for these types of changes. 4. THE SAFEST WATER HEATERS ARE INSTALLED BY PROFESSIONALS The Bradford White Defender Safety System is only available to professional installers – people whose knowledge, skill and experience ensure that the right water heater, and one designed to be very safe when installed correctly. The peace of mind you realize by having a plumber install your water heater is a priceless commodity you can get at a reasonable price. 5. A PROFESSIONAL STANDS BEHIND HIS WORK When you hire a professional to do the installation, he’s there to back up his work and to shoulder the responsibility that comes with the job. 6. 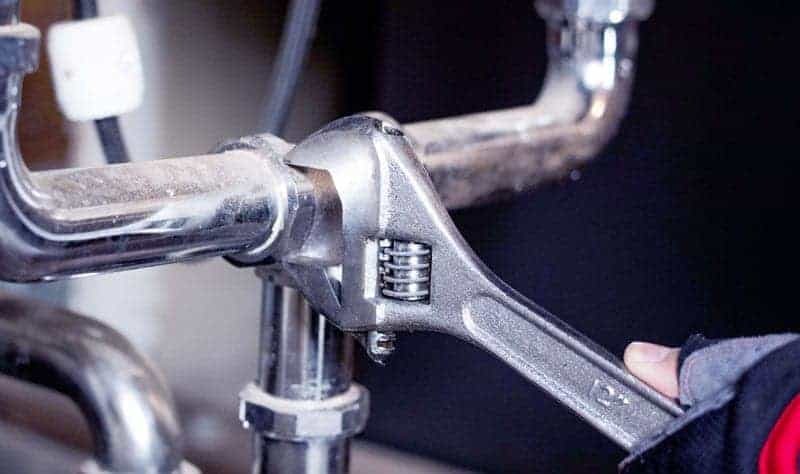 TROUBLESHOOTING IS FOR THE PROFESSIONAL If you’re not familiar with what causes that rattling noise, that sulfur smell or that sudden reduction in available hot water, it’s best to do the right thing first. Call a professional. 7. ONE CALL DOES IT ALL When you call a professional to install your new water heater, you’ll get a complete and efficient job well done. The professional will answer all your questions and use all the right materials. 8. 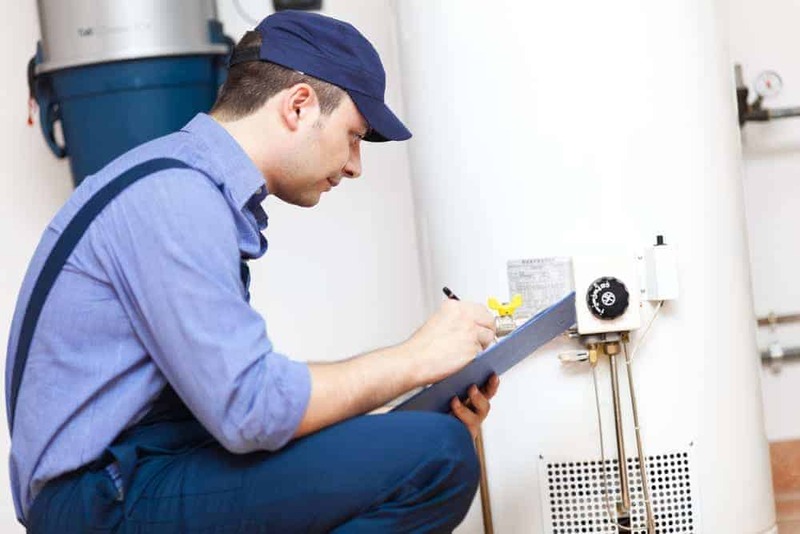 A PROFESSIONAL DOES A FULL SERVICE JOB When you hire a professional, you’ll get delivery and careful handling of your new water heater, proper installation and removal of the old water heater from your home. 9. YOUR CHOICES AND OPTIONS ARE VARIED A professional can show you water heaters with improved features and higher operating efficiency and tell you how they may negate the need for a large capacity model. 10. AVOID INSTALLATION MISHAPS Installing a water heater can be a challenge. An inexperienced installer could inadvertently dry-fire the elements, damage delicate parts, cross-thread gas connections or forget to elevate the water heater or use earthquake strapping where necessary. 11. A PROFESSIONAL UNDERSTANDS PROPER SIZING Part of the professional’s job is to properly size the water heater. That includes calculating the demands from multiple bathrooms, dishwashers, clothes washers and any other points-of-use. 12. A PROFESSIONAL UNDERSTANDS THE IMPORTANCE OF PROPER VENTING It is critical to vent the unit to the manufacturer’s specifications. Improper vent size, total length or configuration can lead to a dangerous build-up of carbon monoxide inside the home. 13. INSTALLING THE PROPER T&P VALVE The temperature and pressure relief valve opens to relieve pressure. Improper installation or the choice of an inadequate valve can cause damage to the water heater or a hazardous pressure build-up. 14. WORKING SAFELY WITH A GAS FUEL SOURCE Oil and Gas-fired water heaters require knowledge of the gas or oil fuel source and an understanding of gas connections supply lines and start up. A professional has this experience and knowledge. 15. USING THE CORRECT MATERIALS The choice of material types and sizes for venting, water inlet and outlet pipes and electric feed lines is best left to a professional. 16. THE JOB IS DONE RIGHT THE FIRST TIME When you have a professional install your new water heater, you get the most for your money as well as the satisfaction of knowing the job was completed with expertise and experience you can trust. 17. A PROFESSIONAL WILL HELP YOU AVOID SCALDING Water heaters are factory-set at a certain temperature for your safety. Your professional will explain the settings and the dangers of improper use of the water heater’s thermostat. 18. A SIMPLE WATER HEATER…ISN’T With new industry-wide design changes like the Defender Safety System™, today’s water heaters are more complicated than ever. Proper installation and service require that water heater manufacturers provide training and education. This valuable knowledge is only available to a professional installer. 19. PROPER DRAINAGE IS A MUST After several years of good service, a water heater could leak or expel water due to pressure build-up. This could cause damage to floor coverings and other items. A professional will install a drain pan and pipe it properly to a drain. 20. GETTING THE RIGHT GAS WATER HEATER FOR YOUR HOME Gas valves are designed to handle a specific type of fuel. Some gas-fired water heaters are designed for certain types of homes. Making the wrong choice can be a serious hazard. 21. KNOWLEDGE OF ELECTRICITY AND ITS USES Installation of electric water heaters requires knowledge of the properly rated wiring material as well as knowledge of the home’s electrical capacity. An adequate electrical service is a requirement. 22. A PROFESSIONAL UNDERSTANDS THERMAL EXPANSION Do you have an open or closed water system? Closed systems are subject to thermal expansion and pressure build-up. Open systems can become closed when check valves, water softeners or water meters are added. A professional will add an expansion tank to avoid problems. 23. PRESSURE BUILD-UP IS A SERIOUS MATTER Even if your water heater tank doesn’t rupture from thermal expansion, pressure inside the tank can cause a constriction of the flue tube. This, in turn, can cause a back up of combustion gases and carbon monoxide inside the home. 24. MULTI-PURPOSE WATER HEATERS MAY BE THE ANSWER Dual-purpose models can be used for space heating and snow melting when properly connected to a hydronic piping system. A professional knows where to find these special models. 25. MANY SPECIAL WATER HEATERS AREN’T SOLD TO CONSUMERS As with Bradford White’s Defender Safety System™, some water heaters cannot be purchased by the public. There are literally thousands of models with important variations and safety features that you’ll never know about unless you call a professional. 26. IT MAY BE TIME FOR A TRADE-IN Even if your water heater is functioning adequately, maybe you’re not getting as much hot water as you need. It may be time to upgrade. It’s tough for a retailer or non-professional to advise you. A professional can give you guidance and explain your options. 27. GETTING A PROPER DIAGNOSIS OF THE PROBLEM If your water heater looks fine but it just won’t make hot water, a professional can diagnose what may be a simple problem. You may just need an inexpensive replacement part. 28. A PROFESSIONAL HAS THE EDUCATION AND EXPERIENCE IT TAKES A professional has taken years to hone his craft. Installing water heaters is one of the things he does for a living. When a plumber comes into your home, he knows exactly what to do. 29. A PROFESSIONAL IS ON TOP OF NEW TECHNOLOGY Because professionals often attend trade association meetings, events sponsored by water heater manufacturers and also subscribe to trade magazines, he or she is the first to know when more efficient models or technology changes are available. 30. LAWS GOVERNING INSTALLATION In many parts of the country, state agencies and local municipalities have laws and codes governing the installation of water heaters. These laws state that a water heater must be installed by a licensed professional.